It seemed like a good idea: splice cable systems and phone lines and, presto, interactive television! Doesn’t everyone who talks to a TV want the TV to respond personally? The answer, it appears, is no, not even with Picturephone. Davis, a comic novelist (A Meaningful Life, 1971) and a seasoned reporter with a bent for dubiety (Bad Money, 1982) applies his well-honed sense of irony to a story of the lords of electronic media, who hunt for the killer app hidden in the fat pipeline of coaxial cable. In the rush to eat the other guys’ lunches, the crafty top dogs may not have all the technical problems within their grasp, or even understanding, but no matter. Among the CEOs seeking sinecures more avidly than synergies, the greatest schemer is clearly handsome, enigmatic John Malone. The fabled billionaire boss of TCI hustled stockholders, phone companies, equipment purveyors and entertainment providers using basic leverage, byzantine spin-offs and generally clever financial sleight of hand to promote a service consumers didn’t want. That didn’t stop him. Malone’s latest thimblerig involves a sale of his business to AT&T for well over $30 billion. The transaction somehow makes him a major phone company shareholder and still keeps him in control of his own firm. A neat trick, indeed. 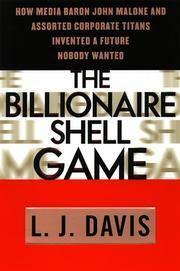 Supporting players in Davis’s story include such media stalwarts as Steve Ross, Barry Diller, Sumner Redstone, Rupert Murdoch, Ted Turner and a squad of tycoons, each trying to improve the thinking of the others. The character delineation is sharp, many adventures are likened to WWII escapades and (though the clichÈ “riches beyond the dreams of avarice” is seriously overworked) the writing has verve and a decided attitude. The media shell games haven’t ended. Now, maybe, if the Internet combines with cable, somebody’s new dreams of avarice may be exceeded. A cautionary tale, indeed, of pirates of the high frequencies dealing with optical fiber, coaxial cable, microwaves, huge debt, and smoke and mirrors.